It’s already shaping up to be a high-grossing year for The Lego Group, but the Danish company has been steadily expanding for years. The multimedia juggernaut has produced video games and TV shows while acquiring major licenses like The Lord Of The Rings, Harry Potter, Star Wars, and both DC and Marvel’s superhero universes. The brand reached a new cultural milestone with last weekend’s release of The Lego Movie, a commercial and critical success that has received overwhelming praise for its breathtaking visuals, surprisingly poignant story, and sharp sense of humor. Thanks to the ingenuity and wit of co-writers and directors Phil Lord and Christopher Miller, it’s much more than an extended commercial. Both of them are correct, and combining the two definitions ultimately brings the father and son together. Finn gets to play in these expansive environments that his father built while his father gets to indulge in his more juvenile instincts, finding a way to make himself a hero to his son by showing off his creativity. The film hits the standard children’s movie plot points of a hero discovering his potential by breaking out of his comfort zone and exploring the world, but it achieves deeper resonance in the real-world scenes by becoming an explicit reminder to adults not to forget the imagination and wonder that made childhood such a delight. In the process, it also reminds the consumer of Lego’s versatility as a product; each box comes with instructions to create a specific 3-D image, but once that image is completed, those pieces can be used to build just about anything. Lego sets are not cheap, so emphasizing flexibility and reusability makes the product look like a smarter investment. Today’s big-budget cinema landscape is franchise-oriented, so it’s no surprise producers are looking at all sorts of properties that could be translated to the screen, from popular book series to comic-book superheroes, board games, and action figures. Children’s entertainment in particular has had a long history of being tied to specific products: ’80s TV shows like Transformers, G.I. Joe, and Masters Of The Universe were all based on established action-figure lines from Mattel and Hasbro, starting the trend of tying a show’s future to the success of its merchandise. The spiritual predecessors of The Lego Movie, the Toy Story films use Fisher-Price and Mattel toys to ground the story in a recognizable reality and add nostalgic weight to the story for people who played with Barbie and Mr. Potato Head as children, a strategy that Wreck-It Ralph employs with video game characters. Those animated films from Pixar and Disney succeed on an emotional front, but they don’t spotlight a specific product the way The Lego Movie does. This film does incredible work highlighting the sheer diversity of the Lego brand, navigating through a variety of locations based on specifically themed Lego sets and including a large number of licensed characters. A quick list of the various properties represented: The Lord Of The Rings, Harry Potter, Star Wars, Teenage Mutant Ninja Turtles, The Simpsons, and DC heroes like Batman, Superman, Wonder Woman, Green Lantern, and The Flash. (Warner Bros. owns DC, so no Marvel characters appear in the movie.) Many of those characters appear as quick cameos, but they give the viewer a strong idea of the Lego empire’s massive size. These properties are normally separated in their respective universes, but sharing Lego’s blocky template unites them. Want to use the Millennium Falcon to fly Superman and Milhouse to Hogwarts? Go ahead. The possibilities are endless, and the scope of the line only grows as new properties are acquired. 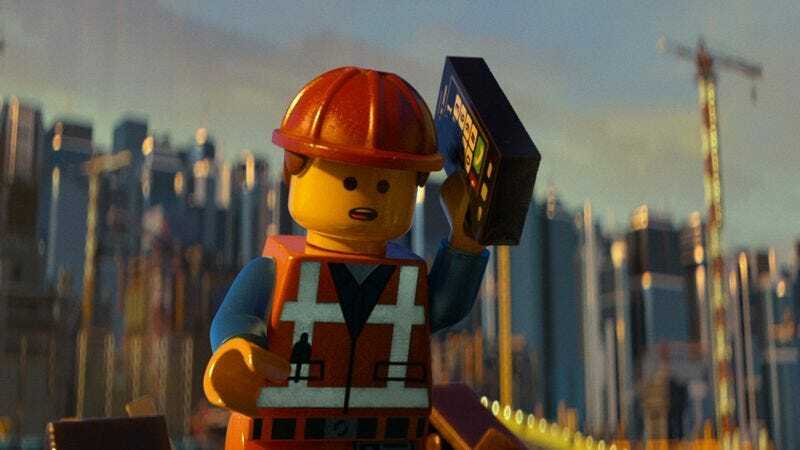 One criticism of the Lego brand in general is that it caters primarily to boys, and The Lego Movie is similarly focused on male characters and relationships, but the script ultimately benefits from the specificity of the father/son relationship. There’s a sense that Finn represents the creative path his father never took as he chooses to indulge his imagination rather than adhere to the instructions, and the disproportionate number of male to female characters makes sense considering the plot itself is a product of a male child’s imagination. The perspective may skew male, but the emotional core is universal, exploring the relationships between parents and children while outlining the differences of adulthood and youth. With a sequel already on the way, hopefully the next film will include more gender diversity, but there are still plenty of reasons for girls and women of all ages to check out this film. The Lego Movie debuted with a huge $69 million opening weekend; that’s millions of people who have just been shown the near-infinite potential of small, pricy plastic bricks, most of them kids. It’s not hard to guess what the majority of those children will want for their birthdays. And Christmas. (This movie is going to be available to own in a few months, so parents ought to get ready for a barrage of requests for Lego sets.) It’s going to be a very good year for Lego, and they deserve it for producing a merchandise tie-in that is as engaging and satisfying as The Lego Movie. The film offers invaluable lessons for future projects based on licensed properties, not just telling a story inspired by a product, but telling a story about a product, providing a practical, personal perspective that adds remarkable depth to a movie that is also gorgeous and a lot of fun. The phrase “Everything is awesome” is repeated throughout the film, but walking out of the theater, the viewer is left thinking about the one specific thing that just inspired 100 minutes of awe: Lego.